Salt, water and a little bit of time are all it takes to transform a cucumber into a totally different kind of food. 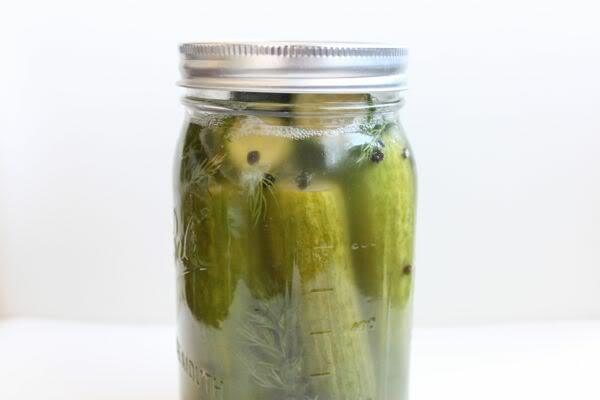 Many store bought varieties of pickle use vinegar to guarantee the sour flavor and act as a preservative. However, using vinegar instead of salt and water actually stops the natural fermentation process. Without fermentation, live bacteria necessary to turn cucumbers into a probiotic food are not there. Also, pickles soaking in vinegar for a long time seem to get overly sour tasting and soft in texture. This recipe was adapted from The Food Network but contrary to their recipe, we opted to not add any spices to the mixture in an effort to taste the effect of brined only cucumber pickles! We couldn't have been more pleased with the result. Wonderful 1/2 sour pickles after 10 days. We have taken them from the crock and placed them in jars in the brine and refrigerated them. A simple adjustment of the water/salt ratio should allow you to make up a single large jar quantity to try this. Keep reading after the jump for the simple instructions. Photo Courtesy"Marks Daily Apple"
1.You can see how to make a simple adjustment to allow for a single jar of brine. Combine the salt and water and stir until the salt has dissolved. 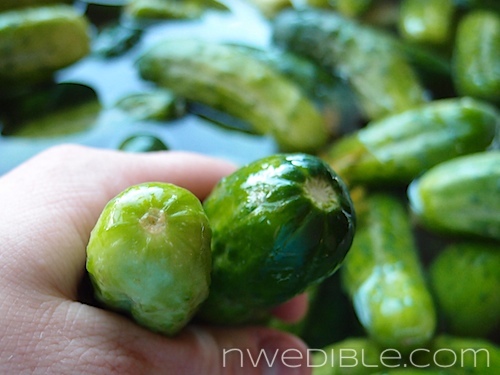 2.Wash your cucumbers. With a sharp knife, cut a very small slice off of the blossom end of your pickling cucumbers. The blossom end is the OPPOSITE end to the stem end of the cucumber. In case your cukes have had the stems removed, the cuke on the left is the blossom end, ie the flower that the cuke grows from and the cuke on the right is the stem end or what attached the cuke to the plant. There is an enzyme in the blossom that can make the pickle soft and unsafe to eat, so trim a 1/16 slice off of that end. 3.Place the spices in the crock or jar. Obviously adjust the quantity when using a small container. As I mentioned at the beginning, we opted out of adding any spices in order to taste what the brining procedure alone would be like. We were totally pleased. 4. 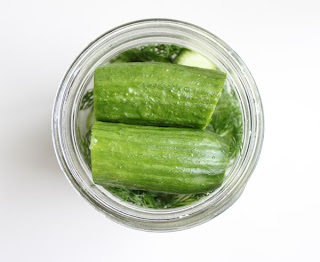 Add the cucumbers to your container. You can leave them whole or cut them in half. 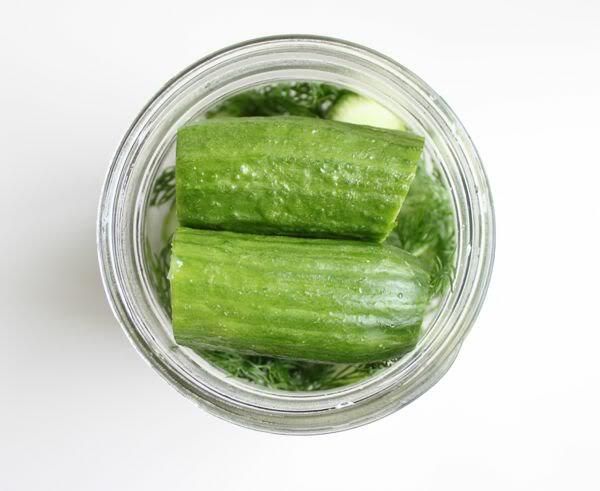 The brining occurs a little more rapidly with a smaller cucumber, even faster if it's cut in half. We left ours whole. 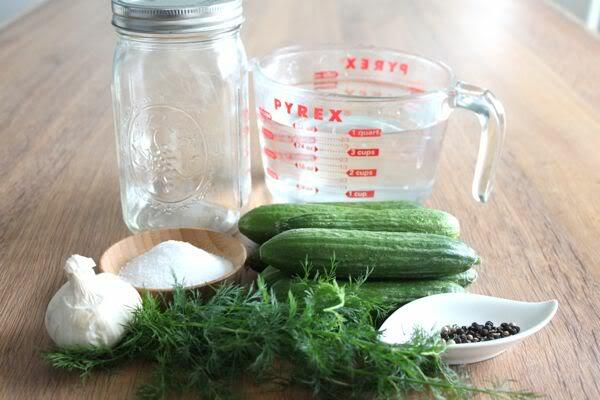 5.Pour the brine mixture over to completely cover the cucumbers. Pour the remaining brine mixture into a freezer bag and place on top of the cucumbers in the crock to keep them submerged in the brine solution. Set in a cool dry place, about 70 degrees F or 21 degrees Celsius. Or if you are brining in a jar check out the photos below. Notice the cucumber pushed in crosswise at the top of the jar to keep the cucumbers submerged in brine. Place the lid on loosely,don't seal it. Check the crock or container after 3 days. Fermentation has begun when you see bubbles rising to the top of the container. After this, check daily to remove any bits of foam that have formed. Lift the bag off or lid and rinse it. Use a spoon if needed to remove any foam from the inside of the jar. After 7 days the pickles should taste sour and the bubbles should have stopped rising. Now cover your container loosely and place in the refrigerator. Continue to skim if needed for the next 3 days. At this point, 10 days,... I transferred my pickles from the crock to jars to take up less room than the crock in the refrigerator. I sliced some in half length wise and filled each jar with the original brine. The brining does continue when refrigerated although its much slower. These seem to taste better everyday and I think that they will be full sour pickles after a month. They say that these pickles store well refrigerated for a couple of months. We'll be surprised if they last that long! Of course, if at any point the pickles become soft or give off an odor, this would indicate spoilage and I would discard them immediately. I hope you enjoy your adventure in pickle creating as much as we have!